A complex web of blackberry, cherry, strawberry and spice with undertones of earthiness. Pairs well with grilled salmon, grilled Portobello mushroom and barbecue pork. These grapes are the inspiration for Baker Family Wines. Sourced from Dusty's estate vineyard in Placer County, where the warm climate deepens the flavors and richness of the fruit. Extremely limited in production, this vintage wine is the result of complexity with firm tannic structure and intense varietal character. The wine expresses aromas and tastes of cherry, raspberry, vanilla followed by a spice finish. Serve with chicken, beef, pasta with red sauces and Mexican dishes. 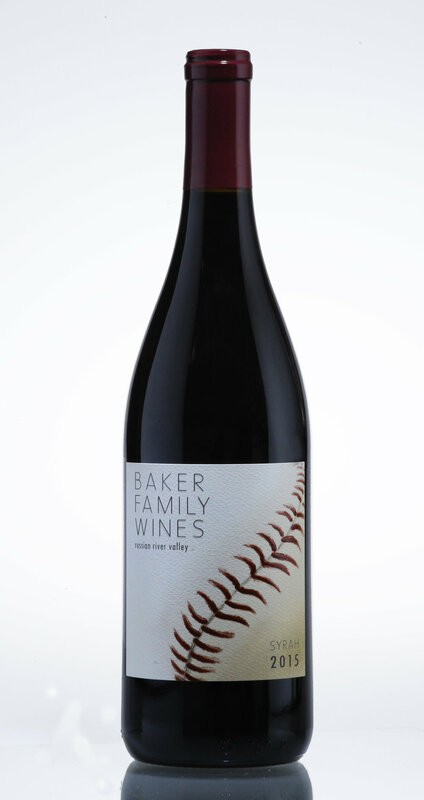 This is Baker Family Wines first release of Zinfandel. Aged in French Oak barrels, this bold Zinfandel is smooth on the palate and fruit forward to the finish. This wine expresses itself with black cherry, blackberry, blueberry with aromas of black licorice and earth, ending with a creamy vanilla finish. Enjoy with grilled meats of all kinds, lamb, sausages, roast pork, barbecue and stews. This is an Old World style of Syrah is full-bodied in flavor with a lingering velvety finish. Bright and crisp, this wine expresses tropical fruit, honeydew melon and hints of coconut with banana aromas. Serve with chilled shellfish, seafood or an herb based chicken. The white grape of Italian heritage thrives in the Fiddeltown appellation in Amador County. Fermented and aged in stainless steel, this medium-bodied wine is multi-dimensional on the pallet with a crispy zesty finish. Grapefruit, white peach, and passion fruit with the aromas of banana and citrus. Pairs delightfully with fish, cheese, gyros, Mediterranean style meats with lemon, capers, and olives. Thai and Vietnamese food. This is a dry, light bodied wine that bursts with tropical and citrus flavors. Very refreshing with a clean finish.